An economy is built on science, technology, and entrepreneurship. That has definitely been the case in today’s top economy, like the US and other countries throughout history. During the last few years, the Trust has worked a lot on bolstering Puerto Rico’s research infrastructure. Researchers, who generate the ideas that serve as foundations for new businesses that solve the people’s problems, now have more funding available through our Research Grants Program. They’re also creating new collisions in our Research and Innovation Meetups, which are providing a great platform for them to meet and work with their colleagues from other institutions. But ideas need much more to complete their journeys from the lab or the computer to the market. Specifically, those innovators and their ideas need to interact with entrepreneurs and investors. Entrepreneurs are able to put ideas from research into practice, and thus make them accessible for individuals and society in general. They also create wealth and jobs, necessary for an improved standard of living. The Trust exists precisely to facilitate that, and to provide the resources to make stuff happen. That’s why we, in our mission to “continually advance Puerto Rico’s economy…through innovation-driven enterprises”, have also focused so much energy on initiatives that help entrepreneurs commercialize their ideas. In the last 3 ½ years, we’ve organized or sponsored most of the projects or events geared to building entrepreneurship skills and opportunities in Puerto Rico. More than 15,000 people have participated in entrepreneurship and networking initiatives led or backed by the Trust, and more than $1.4 million invested in entrepreneurship training initiatives. 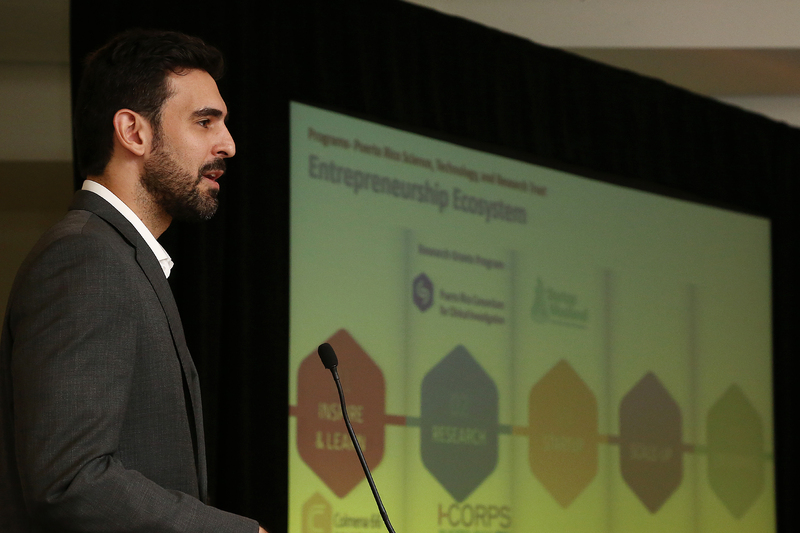 Initiatives like the iCorps, the Tech Summit that provide space for future entrepreneurs to learn, interact, and develop ideas into something concrete. Initiatives that work towards our mission, towards advancing Puerto Rico’s economy. We are constantly working towards new opportunities, visit our website to learn more and participate in our activities. I would like to single one of our initiatives out, though. The last 6 years have seen a dramatic growth of the innovation ecosystem in Puerto Rico. Where before there weren’t many learning opportunities to acquire the skills necessary to excel in the technology sector, now there are many. Nevertheless, push has come to shove. It’s time to facilitate the creation of high-impact science and technology startups that solve global problems and create wealth. That’s why we allied with the Department of Economic Development and Commerce(DDEC) and with the Puerto Rico Industrial Development Corporation (PRIDCO) to launch Parallel18. Parallel18 is a global accelerator program that offers a unique gateway for startups to scale from Puerto Rico. It provides equity free funding, office space, and most importantly, a world class mentoring curriculum and network that support the participating businesses. We’re already seeing faster-than-expected short-term results, such as local employment and economic activity. But we’re aiming to help Puerto Rico be an innovation hub from which ideas can be scaled globally. Soon you will read more about Parallel here in our Forward Blog, but you can visit their website, parallel18.com, to learn more. With Parallel18, our other programs, and our continued support to our science and technology community, the Trust will continue working toward a vibrant innovation economy that encourages innovation, commercialization of technology, and creation of jobs in the technology sector. It’s our job to do so through innovation-driven enterprises. At the Forward Summit you will have the opportunity to meet some of the startups and talk with entrepreneurs and researchers that are working on commercialization projects. Join Forward and get inspired by this great community that we have in Puerto Rico. Be part of it! About the author: Mr. Ríos is the Chief Operating Officer of the Trust. Previously he was its Acting Director, reorganizing its administrative and operational structure while leading the launch of several flagship programs such as: Science and Technology Grants RFP, Clinical Trials Project, and the Bioprospecting Initiative. He also served as Under Secretary of the DDEC of Puerto Rico in charge of projects such as the Port of the Americas in Ponce and entrepreneurship initiatives. As a lawyer, he has represented startups and businesses in corporate, commercial, intellectual property, and civil litigation matters. He is actively involved in technology, entrepreneurship and legal initiatives in PR, as a judge and advisor in Startup Weekend, as one of the founding organizers of TEDxSanJuan, and as former President of the Corporate Law Commission of the Puerto Rico College of Lawyers. He completed a BBA from the Interamerican University of Puerto Rico, and his Juris Doctor from the UPR.